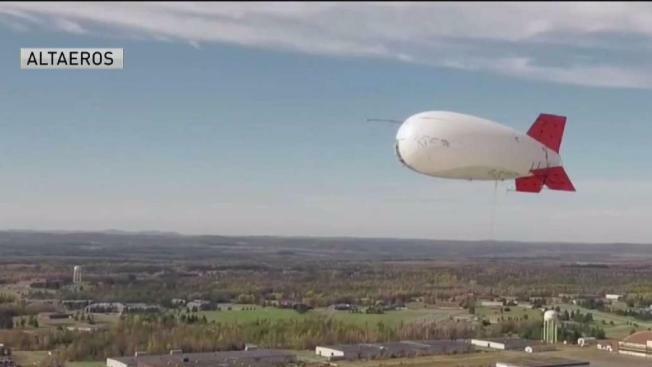 The town of Fremont, New Hampshire, is the tsting ground for a blimp expected to bring affordable cell service to rural areas. A new cutting edge technology is being tested in Fremont, New Hampshire. Altaeros Energies, based in Somerville, Massachusetts, is building its permanent research and development center in Fremont, which will house its SuperTower blimp called an aerostat. According to Altaeros, the tethered blimp will be capable of carrying enough broadband cellular service to replace 20 to 30 cellular towers. The company's goal is to make cellular connectivity for rural and remote communities more affordable first in the US and then worldwide. Ben Glass, CEO of Altaeros Energies, said that they will provide service to big and small cellular carriers so that they can expand into rural communities. The construction site for the R and D Center is located at 662 Main Street in Fremont. It will include a concrete launch pad and an oversized hanger to house the aerostat. Glass said the aerostat will be lifted 800-850 feet into the air being powered by helium. Scott Dyer, site operations manager for Rubb Building Systems, which is in charge of the building, said the project has a 6-7 week timeline. Dyer said Altaeros plans to lift the blimp in April or May. Residents in Fremont appear to be embracing the airborne experiment. "Seems like a pretty unbelievable thing," said Steven Bonaccorsi at Fremont Pizzeria and Restaurant. "What I think is great about it, is that it's up in the air." Cathy Murdock of Fremont said, " I think I would be intrigued." Selectman Roger Barham said the nearby residents will endure minimal impact during the construction and subsequent testing site. Barham said in a statement that "the existing parcel is primarily operating as an excavation and gravel site on a parcel footprint of approximately 180 acres. The Altaeros site has been located at the center of the parcel so that its proximity to abutting residents is greater. The nature of the Altaeros operation has little environmental concerns, and noise was not raised as a potential concern. The visibility of the aerostat whilst it is in operation was discussed extensively. The consensus was that this was not a major concern given the aerostat is a test unit and not airborne continuously, and its size and height in conjunction with the proximity of trees." Barham said the town Planning Board approved Altaeros application to fit the testing site because the applicant met all zoning and site plan regulations, and had obtained all necessary permits prior to construction. During the public hearing process the site did pose any significant impact to the town. Although the development of the site will not improve cell phone coverage in the town, the Planning Board is required to act impartially and balance the rights of the landowner and represent the interest of the town and its residents. Glass said they plan to target rural Maine first for improving cellular service. While the blimp won't impact Fremont right now, Glass said they are considering the area in the future.